Mill Creek High School won the team title at the Georgia-South Carolina High School Cup Invitational. 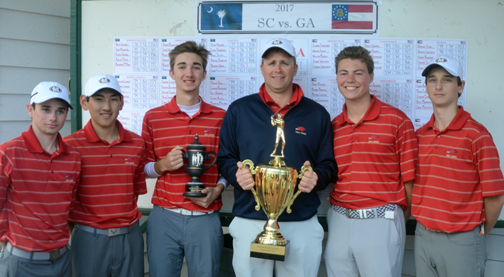 Nine high school teams from Georgia played very solid golf for two days and topped the nine teams from South Carolina to win the annual Georgia-South Carolina High School Cup Invitational at River Falls Plantation. The team from Georgia which included many of the top teams in the state jumped out to a solid lead after the first round of play. The Peach state golfers took a commanding 24 stroke lead after the first round. Scoring was done using the top four scores of each of the nine high schools for South Carolina and Georgia. Only five golfers were able to break par in the first round. The individual lead was shared by three golfers. Dorman’s George Eubanks, Jr. shot a 3-under par 69. He shared the lead with two Georgia golfers. Ben Carr of Columbus and Grant Sutcliff of Lambert were at the top of the leader board. Gaffney’s Cody Transou and Johnathan Parker of Columbus each shot rounds of 1-under par 71 to also break par. Windy conditions caused the scores to got up in the second round, but the Georgia teams still maintained their lead in the 36 hole event. Several South Carolina teams played the event without their top players. 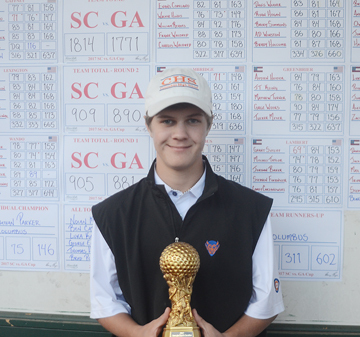 Several Upstate golfers were selected to play in the SCJGA Can-Am Matches at Murrell’s Inlet. Johnathan Parker of Columbus High School won the individual title. Boiling Spring’s Trent Phillips, Gaffney’s Zack Gordon and Lexington’s Gracyn Burgess were among the top South Carolina players who were not with their teams at the tournament. “We missed having those players, but the Georgia kids played great and we kind of scrapped it around the last couple of days,” said Gaffney golf coach Brandon Coggins. “We would have been better with Zack, but I don’t know how much difference it would have made,” he added. The team from Mill Creek, the largest high school in Georgia, shot the best round of the tournament posting a 297 total to move past Columbus and take a five shot victory in the team event. Columbus was second. Dorman was the top South Carolina team finishing in fourth place. The final team score was Georgia 1771 – South Carolina 1814. Columbus’s Johnathan Parker followed up his first round 1-under par 71 with a second round 3-over par 75 to win the individual title by one shot over four golfers. Crane and Nolan Miller of Columbus along with Luka Karaulic of Mill Creek and Transou from Gaffney played off for the runner-up position. 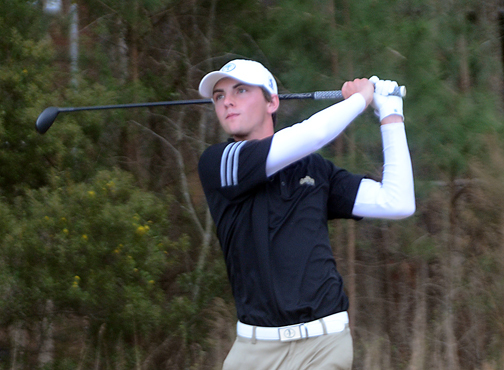 Gaffney’s Cody Transou topped three other golfers in a playoff for the runner-up spot. The playoff went five holes before Transou was able top the three other golfers for the runner-up spot. The Gaffney golfer made several key putts to stay in the playoff against the other three golfers and finished off the playoff with a solid par. The tournament was started several years ago by former Dorman boy’s coach Lewis Terry. The event alternates golf courses in both South Carolina and Georgia.